PHILADELPHIA -- Tommy Joseph hit his first major league homer as part of three-hit game to lead the Philadelphia Phillies to a 3-1 win over the Miami Marlins on Tuesday night. Six Phillies pitchers combined to strike out 17 Marlins. Joseph hit a solo shot in the second inning off Marlins starter Wei-Yin Chen (3-2) and hit cleanup in just third big-league game. Joseph's single in the sixth helped make it 3-0 when Marlins center fielder Marcell Ozuna booted the ball and allowed a runner to score. Vince Velasquez (5-1) struck out 10 in five innings, his highest total since he fanned 16 San Diego Padres in an April 14 shutout. Velasquez has not pitched out of the seventh inning since that game and was lifted against the Marlins after 103 pitches. Jeanmar Gomez allowed a run in the ninth and earned his 15th save. 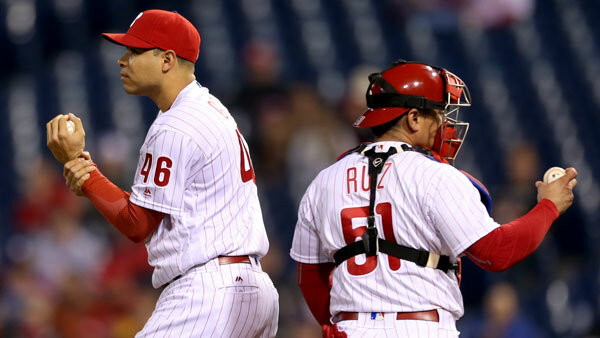 Velasquez entered the game having fanned 49 of the 171 batters he faced, a 28.7 percent strikeout rate that was seventh-best in the National League. He struck out the side in the second inning, then whiffed two batters each in the third, fourth and fifth innings. The Marlins made him work for those strikes. He put the first two hitters on base in the first inning before he retired the next three. Velasquez allowed a two-out triple and a walk in the third, then struck out Justin Bour to end the inning. Joseph received the good-natured silent treatment when he returned to the dugout after he lined a 1-2 pitch that hit the foul pole in left field. The Phillies are one of the surprise teams of baseball, sitting one game out of first place in the NL East. But the biggest cheers from the sparse crowd on a chilly night came when the Phillies showed the 76ers winning the No. 1 pick in the NBA draft lottery on the big screen. The Phillies played some of the 76ers' theme song after the video. Carlos Ruiz caught his 1,000th game for the Phillies. He's the fourth player in Phillies history with 1,000 or more games at catcher, joining Mike Lieberthal, Red Dooin and Bob Boone. He's just the 48th player in MLB history to catch 1,000 games with one team. Ozuna went 0 for 3 and snapped a 16-game hitting streak. He hit .415 with five homers and 11 RBIs over his career-high tying streak. "He's using the whole field now," Marlins manager Don Mattingly said. "Before he was pulling a lot of balls, chasing balls out of the strike zone. Early on, he was really wanting to get off to a good start. If you keep swinging at crap in the dirt, you ain't going to hit. It's pretty simple." Marlins: RHP Edwin Jackson, on the DL since April 19 with a strained right triceps, is likely to return Friday. ... LHP Mike Dunn has thrown two bullpen sessions as he tries to return from a left forearm strain. Mattingly said the next step for Dunn was back-to-back bullpen sessions. Phillies: C Cameron Rupp wasn't in the starting lineup for the third straight game because he has a sore left ankle following a violent collision at the plate to end Saturday night's win. The Marlins send RHP Tom Koehler (2-3, 5.14 ERA) to the mound against Philadelphia RHP Jeremy Hellickson (3-2, 4.12). Neither pitcher has a decision against the opposing team.